This is a review for the product Thyroid Aid Thyroid Support from Research Verified. This particular product is one of the best products have reviewed when it comes to thyroid aid and support. The manufacturer claims that this product has the ability to nourish and support the thyroid while so keeping hormone levels balanced keep the adrenal glands healthy. They also claim that this product keeps your antioxidant levels where they should be. If you want to learn more about this manufacturer, you can read reviews about Research Verified here. Keep reading to learn more about this product. Listed below are the active ingredients in this product. The label states that you use this product as a dietary supplement and take two capsules every day with an 8 ounce glass of water. These are to be taken before meals and to improve effectiveness take 1 capsule twice a day with water and before meals. There are no side effects reported when taking this product. There is a warning on the label that states that pregnant or nursing mothers should not take this product nor should individuals under the age of 18 should consult a physician before taking this supplement. If you have a medical condition you should also consult a doctor before taking. Research Verified offers three different packaged options for your convenience. You can purchase one jar which is a one-month supply for $48.00. If you prefer to purchase in bulk, you can buy a three-month supply for $98.00 which saves you 53% if you were to purchase the product individually. You can also purchase a six-month supply for $142.00 which saves you 66% off of the retail cost. When you purchase in bulk you save a lot more money and get a lot more product. Research Verified provides customers with a Risk Free 365 Day 100% Money Back Guarantee. There are also a number of positive reviews regarding this product as well as the 100% money back guarantee that they offer their customers. If you are not completely satisfied with this product then all you have to do is simply send the partially used product back to the manufacturer and you will receive a full refund, no questions asked. Regardless if the products are opened or not, they are eligible for the refund. Customers can also contact customer service via phone or email if they have any questions regarding returns. 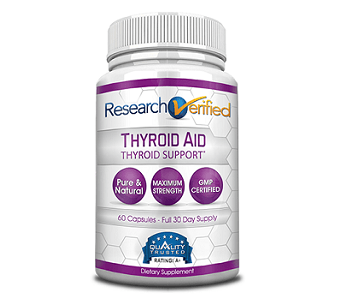 This Thyroid Aid and Support product by Research Verified is one of the best thyroid products I have reviewed in its genre. Their website is very thorough and answers most all of your questions about the product. There are a lot of positive qualities about the product that make it marketable. Research Verified offers a 365 day 100% money back guarantee which shows that they stand by their product and believe that it is effective. This makes it easier for consumers to make a choice to purchase a supplement. There are no additives or chemicals in this product so there will be no significant side effects. There were numerous customer reviews available that were extremely positive in nature. All of the reviews stated that this product was effective, had little to no side effects, and helped maintain a healthy thyroid.